The story of clock making in the Black Forest begins around 1630. People there had always crafted and carved using the local wood that was one of the few natural resources in the area, especially during the long winters when the land was covered with snow and they could hardly leave their houses. It must have happened around 1630 that a peddler who sold glass from the Black Forest to foreign countries, returned with a clock, perhaps from the land of Böhmen (today's Czech Republic). Somebody in the Black Forest must have been fascinated by this technical wonder that kept time much better than the hourglass or sundials that were used in the area at that time. So, this person built his own clock, and started the tradition of clock making. Those first clocks were rather primitive. They used toothed wheels made of wood and simple stones as weights. Instead of a pendulum, they used a piece of wood called a "Waag" that moved forward and back above the clock dial, to make the clock keep time. Most of the people who made clocks at that time were not the rich farmers, but the so-called "Häuslers". In the Black Forest area, usually the oldest son of a farmer inherited the farm; his siblings only got a small piece of land. Those "Häuslers" had to work for other farmers to survive during the winter-months, and clock making was a welcome way for them to earn a little money. In 1690, the whole industry of clock making had developed in the high Black Forest. People in the Black Forest continuued to improve their clocks. Clock-peddlers traveling to different regions heard about new technology that was developed elsewhere. In 1712 Friedrich Dilger from the small village of Urach went to France for a whole year. He brought back new ideas and tools, and used his new skills in building clocks. Over a period of time, people in the Black Forest began specializing on certain aspects of clock making. 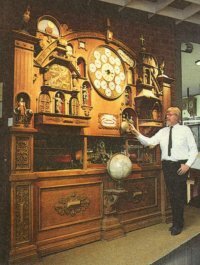 There were carvers, carpenters making the cases, painters (most clocks of that time were flat and painted, and looked quite similar to today's "Black Forest Wall Clocks") and manufacturers of chains and toothed wheels. Some clocks were made with moving figures, for example, a turning couple or a butcher together with a cow. In 1738 Franz Ketterer from the village of Schönwald was the first to build a cuckoo for his clocks. At this time there were large artist's clocks with a calling rooster in towns like Prague, Heilbronn, Berne and Strasbourg. Maybe they were the inspiration for Ketterer to build his cuckoo clock. Making a clock call like a cuckoo was easier than making it call like a rooster, but still it must have been quite difficult to develop this. The call of the cuckoo was made the same way it is today: two bellows send air through pipes. A similar technology was already in use for church-organs at this time. So, Ketterer's clocks were the first with the cuckoo behind the small door that opens on the hour and half hour. Clockmaking became more and more important for the rather poor Black Forest area. It is known for example that in 1808 in Triberg, and the surrounding villages, 790 of 9013 inhabitants were involved in the clock-making. In 1850 the Herzog (Duke) of Baden founded a School for clock-making in Furtwangen, where students learned math and drawing as well as making cases and movements for the clocks. The most valuable Black Forest clock is the "world-time-clock", which was built in 1787. It is located today in the German clock museum in Furtwangen. 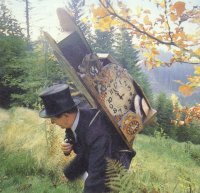 Besides the cuckoo clocks, many other types of clocks were made in the Black Forest, from little models with spring movements, up to large clocks for the towers of churches. One last thing to be mentioned is the origin of the "Bahnhäusle" clocks. When building the Railroad through the rocky Black Forest area around 1860, it was necessary to build many tunnels. For this, skilled tunnel-builders from Italy were hired, and they brought their way of life as well as their architecture with them. Alongside the railroad, lookout buildings were made, the so-called "Bahnwärterhäusles" which show the foreign influence. Adorned with wild grape vines, they were the inspiration for this special type of cuckoo clocks.